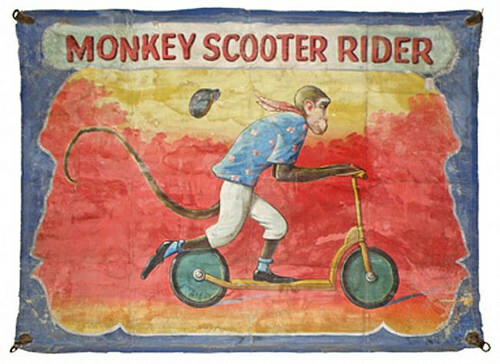 Monkey Scooter Banner by Nieman Eisman, Circa 1930s. Mosby & Co Auctions, May 16, 2015. We’ve seen quite a few banners of carnival monkeys driving tiny race cars in Monkey Speedways, but never a monkey on a scooter. Considering the current popularity of scooters, this delightful banner could attract some competitive bidding when it goes on the auction block on Saturday. The painting by Nieman Eisman, a master of the Chicago style of banner painting from the 1920s through the mid-1950s, is one of several carnival canvases in Mosby & Company’s Auction on May 17th. The pre-sale estimate of the giant-sized advertisement –it is approximately 6 feet tall by 9 feet wide–is $2,500 – $3,500. The catalogue is online and one can bid now or in real time during the auction. Hollywood Movie Star Banner by Nieman Eisman, Circa 1930s. Mosby & Co Auctions, May 16, 2015. 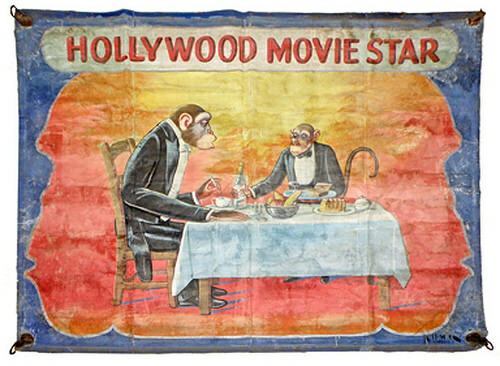 A second Eisman banner titled Hollywood Movie Star shows two tuxedoed monkeys at a fancy restaurant. Banners by both Fred Johnson and Johnny Meah featuring Otis Jordan, “The Frog Boy,” who worked at Coney Island USA’s Sideshows by the Seashore in his later years, are also among the desirable banners in Saturday’s sale. Isn’t this the cutest? 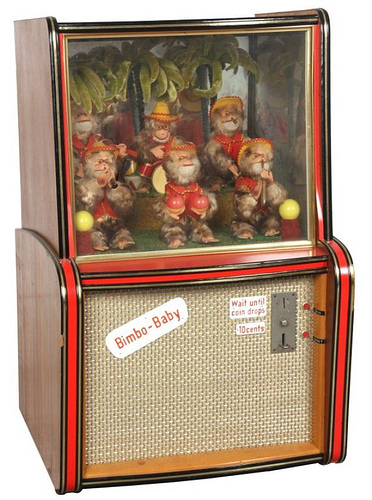 There are already two bids on this circa 1950 “Bimbo Baby” arcade machine featuring a monkey orchestra. It has a starting bid of $1,000 and a pre-sale estimate of $2,000-$4,000. The sale is on Saturday morning at Fontaine’s Auction Gallery in Pittsfield, Mass., not far from where my Dad once had a real live monkey on the midway. Bimbo Baby Automaton Arcade Machine. 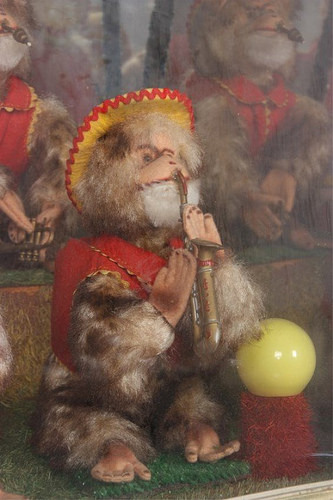 German, c.1950, coin operated automaton box lights up inside with 6 figural cabana monkeys on a tropical decorated stage, the figures dance, shake and play their instruments; has a speaker built into the base which plays music through a Tefi Spezial-Band cassette (tape in cassette is unwound). Animated mechanism is in good working condition. 38 in. high x 24 in. wide x 23 in. deep. Now if somebody would just drop a dime in the slot and make a YouTube video of the toy monkeys dancing and playing, we’d be delighted. Coming across this photo of an “Antique Circus Monkey Racing Car” recently sold by Chicago dealer Architectural Anarchy rekindled the curiosity that I felt as a carny kid. My father’s story about how he had a real, live monkey on a trapeze in his popcorn trailer to attract customers in the 1940s began with mention of where he got the idea: a Monkey Speedway! It was at the Patriots’ Day Celebration in Boston. The term was one I’d never heard before because this long popular carnival attraction had by then disappeared from the midways of New England. Right through the 1950s and 60s, carnivals placed ads in the Billboard and then Amusement Business for Monkey Circuses and Speedways as well as managers to run them. “We are interested only in a show man that can and will work hard for a seasons bank roll,” said an ad for King Reid, New England’s largest carnival, in 1946. Carnival supply house H.C. Evans called its Monkey Speedway “The unbeatable carnival attraction! 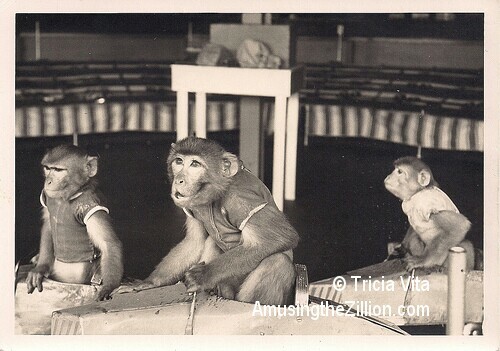 Equal to a free act!” A trio of trained monkeys in little metal cars raced around a wooden track while people placed bets on the laydown of numbers. The prizes were boxes of candy, my father said. It was the crowd-stopping appeal of the Monkey Speedway that gave Dad the idea to put a monkey act in his popcorn trailer one spring when the show owner changed the location of the merry-go-round, leaving him up in front with no customers. After trying unsuccessfully to buy one of the Speedway monkeys, my father went to Benson’s Wild Animal Farm in New Hampshire, where they had monkeys for sale. When the kids would ask what’s the monkey’s name?” he’d say, “I’m Sears, he’s Roebuck,” and the kids would laugh. Though my father bought and sold Roebuck years before I was born, I felt as though the monkey was my long-lost brother. I just knew that he missed the peanuts, popcorn and pennies as much as I did when we stayed from October through April in my grandmother’s house, away from the free-wheeling life of the road. 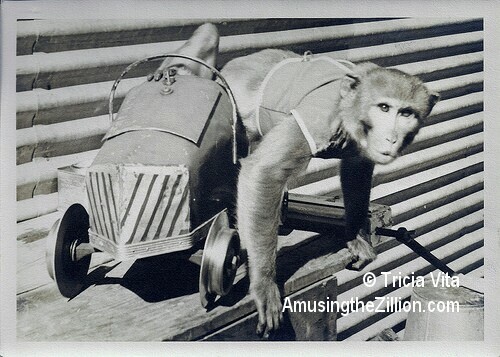 The Monkey Speedway is one of the long-vanished shows documented in the collection of the International Independent Showmen’s Museum in Gibsonton, Florida. 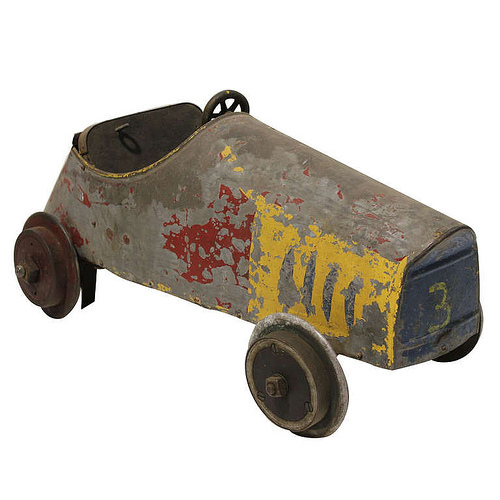 And the tiny race cars, if you’re lucky enough to find one, have entered the realm of folk art. Monkey Go Round, a German film released in the 1960s by Castle Films, is the fairytale-like story of a troupe of monkeys and their caretaker’s show biz comeback and will give you a glimpse of a Monkey Speedway. January 27, 2014: AC Boardwalk, Disneyland Have Model Programs for Feral Cats–Why Not Coney Island?